This is Twilighters Dream and Our Twilight Corner second trip to Forks for Stephenie Meyer Day!!! We are having the Forks Challenge again!!! We had such a fun time with this last year we are doing it again!!! 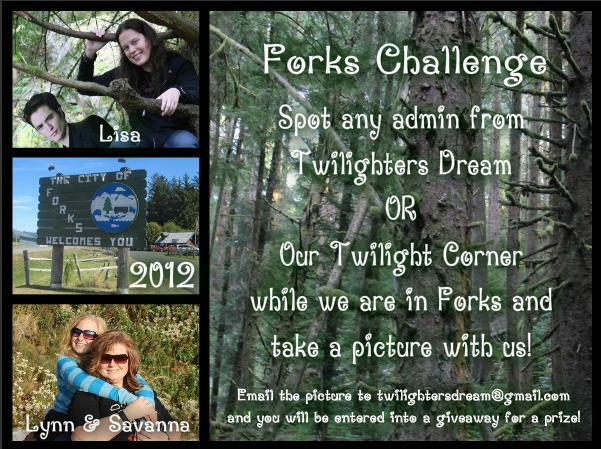 If you are attending Stephenie Meyer Day in Forks, WA this weekend all you have to do is look for us!!!! If you spot either of us Lynn or Savanna from Our Twilight Corner or myself, Lisa, from Twilighters Dream just take your picture with us and email it to twilightersdream@gmail.com. get your pictures emailed. The deadline is September 25, 2012.